I’ll leave it up to you to puzzle out which Starbucks Cake Pops are which. The three flavours are Rocky Road, Tiramisu and Birthday Cake. Adorable! That’s what I think of these crazy new cake-on-a-stick things at Starbucks. Near as I can tell, they showed up at my local Starbucks in the middle of March, placed prominently in the pastry case in a spot I couldn’t ignore. 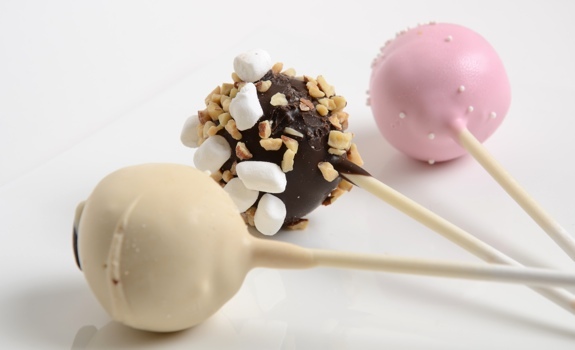 As you’ll see in the photo above, they’re eye-catching little golf-ball-sized chunks of cake that have been jammed on a stick then dipped in a thick layer of coating. They’re like a lollipop, but with cake where the candy should be. Esthetically speaking, they’re absurdly cute. If you bring one back to the office with your coffee, expect to get questions. Inside the outer layer of coating is a core of sweet, sweet cake, but without the light, spongy texture I usually associate with cake. More than one Starbucks barista I chatted with described it as being less like cake and more like cookie dough, a description that’s entirely accurate. Rocky Road: Looks like a chocolate-covered Timbit (a.k.a. doughnut-hole, my American friends) that got dropped on the floor in a nuts-and-marshmallows factory. The cake core is chocolate, the coating is chocolate, and trapped in the coating are almond chunks and tiny mallows. The chocolate cake sweetness and crushed almonds dominate the taste. The texture is more brownie than cake, with nuts and marshmallows incorporated into the cake batter. 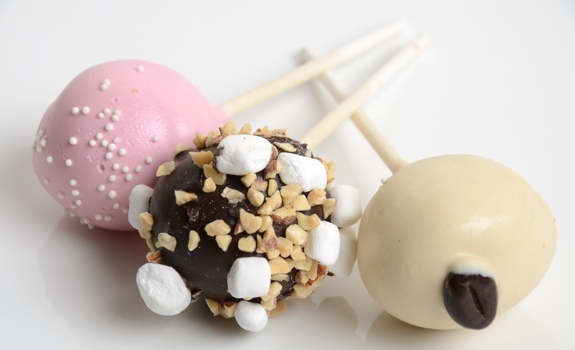 As for the outside marshmallows, they’re at a stage of dryness somewhere between Lucky Charms and regular mini mallows. Birthday Cake: It’s pink and has sprinkles. The cake is vanilla, but it has a very dense, sugar-syrup-soaked texture. It’s sweeeeet, from the white-chocolate coating to the sugary cake innards. Not bad, but the sweetness becomes overpowering by the end of a single cake pop. Tiramisu: The most ordinary looking of the lot, it’s dipped in tan coloured white chocolate and topped with a coffee-bean-shaped piece of espresso-laced chocolate. Instead of vanilla cake, it tastes like super-sweet cookie dough soaked in coffee. It also has the most chemical-ish twang of the three. The first bite is good, but the taste grows tiresome with subsequent mouthfuls. The coffee-bean-shaped chocolate on top was surprisingly intense. My favourite of the three? Probably the rocky road, mostly because it has enough flavours to keep my mouth interested. 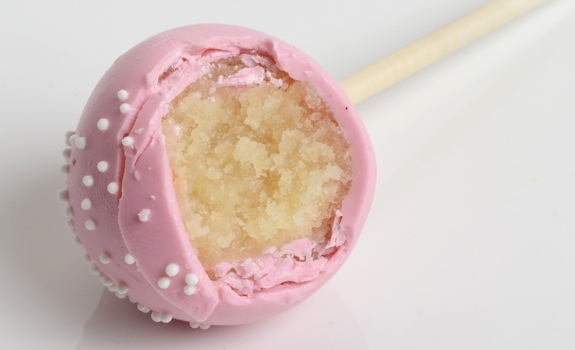 This would be the Birthday Cake Starbucks Cake Pop flavour. See the texture? It’s pretty dense for a cake. Cost: $1.60 per cake pop at my local Canadian Starbucks. There’s a discount if you buy more than one. Value for cash money: Not bad for the novelty, but it won’t fill you up like, say, a chocolate chip cookie, which costs only slightly more. Availability: Starbucks stores. I’ve seen them in Canada (where I live), and the U.S. Starbucks website lists them. Outside of that, I have no idea. If you spot them at a Starbucks elsewhere (Abu Dhabi? London? ), leave a comment. Nutrition? : Each one is under 200 calories. More specifically, the Starbucks website says the birthday cake and tiramisu flavours are each 170 calories, while the rocky road flavour is 180. Lots of fat and sugar all around, as expected. The Starbucks site has detailed nutritional info for each one. The list of ingredients is scary-long. Haven’t I seen these before? : Yes you have. On Bakerella, to be precise. The verdict: Good. Would I eat one every day? No. But as a special pick-me-up after a stressful afternoon meeting? Sure. Why not. Starbucks Cake Pops, from another angle. Because you can never get enough angles, can you? The texture of the cake is different because it’s cake mixed with frosting! To make them, you bake a cake, crumble it all up, mix with frosting, form into balls then dip into the chocolate coating. YUM!